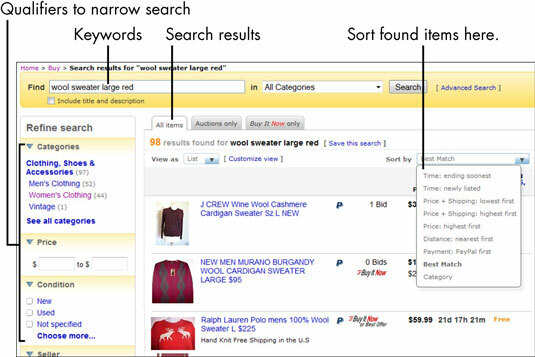 A site the size of eBay can be overwhelming, but you can search with keywords to find what you want on eBay. Keywords are usually nouns (plus some adjectives) that you would use to describe your item. You don’t need to start your keywords with capital letters because they’re not recognized by a search engine — on eBay or anywhere else. At the top of every eBay page, you see a Search box. Type your keywords in that box. Notice that next to it is a link to Advanced Search. Don’t go there. You don’t need the extra options, which can be confusing and unnecessary when you’re searching for items to buy! For example, suppose that you’re looking for a sweater; a clear group of (key)words for your search would be wool sweater large red. If you want the sweater to be a specific brand or made by a specific company (such as Ralph Lauren or Land’s End), include that name as part of your search keywords. 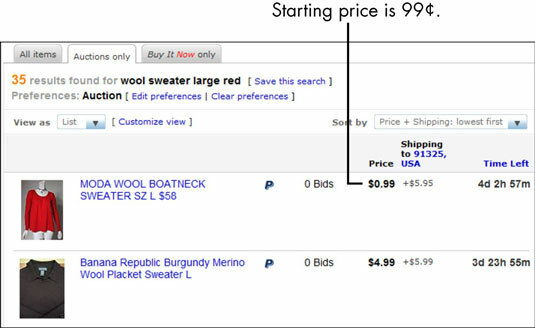 Categories: In this example, if you’re looking for a woman’s sweater, you could click the link on the left to narrow your search to the category Women’s Clothing. You can also click a See All Categories link that would open up your search — you could even find dog sweaters. It’s a lot easier to use the noun dog in your search keywords if you want to find a dog sweater. But eBay sellers don’t always put words like women, ladies, girls, or teens into their titles, so it’s best to leave out those very defined keywords and refine your search by category on your own. Price: If you get a reasonable number of results, don’t narrow things down by price. If a seller has chosen to allow buyers to make an offer on the item, you won’t see them. Condition: Especially in these days, there’s no shame in buying used, and eBay gives you that option. Clicking New or Used narrows results to listings in the condition that suits you. Buy It Now Only: Click this tab to see items that can be bought at a fixed price (or where you can make an offer). By clicking this tab, you can narrow your search to items available for purchase in an instant with a click of your mouse. Auctions Only: You might prefer to participate in a traditional eBay auction. If so, click the Auctions Only tab! Best Match: This is eBay’s magical sorting formula that weighs all sorts of things — including how a seller lists an item, the seller’s feedback, and whether eBay feels the shipping costs are appropriate. Time: Ending Soonest: This selection puts auctions and fixed-price items whose listings are ending immediately on-screen first. This sort order is most beneficial with auctions because it gives you a chance to snap up any undiscovered deals. Time: Newly Listed: Lists the most recently posted listings first. Distance: Nearest First: If you’re looking for a large piece of furniture for pickup, this sort is valuable. You don’t want to pay shipping on huge items — unless you really, really want to own it. Price: Lowest First: With this selection, you find items listed in order from the lowest to the highest starting price asked for an item. Farther down the page on the left, you find a Completed Item search. This tool is most valuable when you’re planning to sell an item. If you’re hunting down a rare or intricately named item, click the Save This Search link at the top of the search-results page. By doing so, you tell eBay to send you an e-mail every time a new item matching your search is listed on the site.